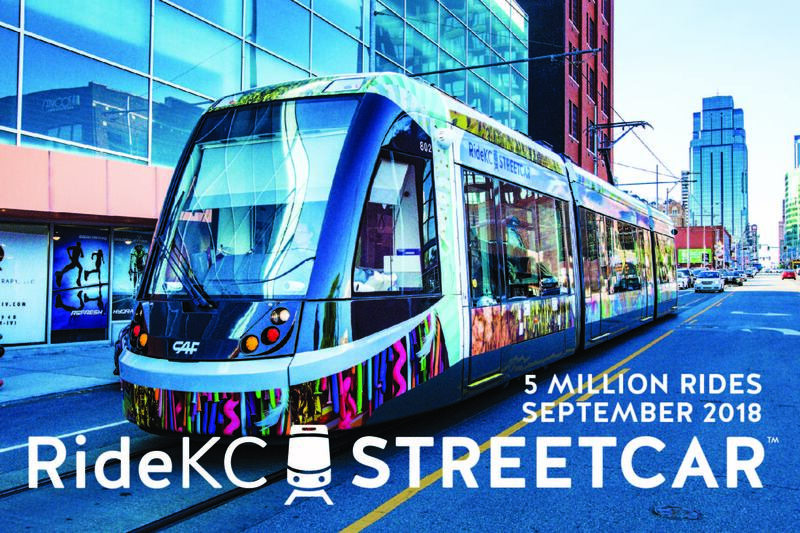 KC Streetcar | Five Million KC Streetcar Rides! Five Million KC Streetcar Rides! This past weekend, with downtown Kansas City, Missouri, alive with activities and events, the KC Streetcar logged its 5 Millionth ride in less than 2 ½ years of service. During this time, the KC Streetcar traveled 305,128 miles with a daily ridership average of 5,806. Each streetcar averaged 76,282 miles and 34,673 trips per vehicle. The summer months tend to be the busiest for streetcar ridership, with July 2018 being the highest ridership month to date with 262,593 total rides, that’s an increase in 31,000 rides from the previous July. The highest ridership day to date was July 6, 2018, with 19,181 total rides. Ridership is important but so is safety and reliability. The KC Streetcar has an average on-time performance of nearly 95 percent and an employee safety record of 863 total days injury free. The KC Streetcar Authority (KCSA) monitors and tracks daily ridership on board the KC Streetcar. Streetcar ridership, otherwise known as “Unlinked Passenger Trips”, is the national standard used by the Federal Transit Administration for calculating usage on public transportation systems across the county. KC Streetcar ridership is calculated by Automated Passenger Counters located over each door of each streetcar vehicle. Passengers are counted each time they board vehicles no matter how many vehicles they use to travel from their origin to their destination. More information about KC Streetcar ridership can be found on our website http://kcstreetcar.org/ridership. The (KCSA) is committed to partnering with organizations and groups that can use the streetcar to explore downtown while also encouraging streetcar ridership. KCSA is currently partnered with the Art in the Loop Foundation to bring art to public spaces, which includes nine art installations/performances and eight live music performances on board the streetcars and at streetcar stops. “The addition of partnering on programmed events helps us to not only increase streetcar ridership but also bring a new experience to our riders whether that is through art, music, community service or scavengers hunts,” said Donna Mandelbaum, communications director with the KCSA. As response to the demand in ridership, the KC Streetcar Authority ordered two more streetcar vehicles for the downtown route. Those vehicles should arrive in 2019. Later this year, streetcar shelters will be installed at the North Loop stops at 7th and Main Street as a direct response to ridership in that area. Additionally, the KC Streetcar Authority, along with the City of Kansas City, the KC Area Transportation Authority and Port KC, are planning for future streetcar extensions north towards Berkley Riverfront as well as the Main Street Extension to UMKC. More information on both of those projects can be found on the KC Streetcar website.